London Design Festival has today launched a new Landmark Project: Please Feed The Lions. 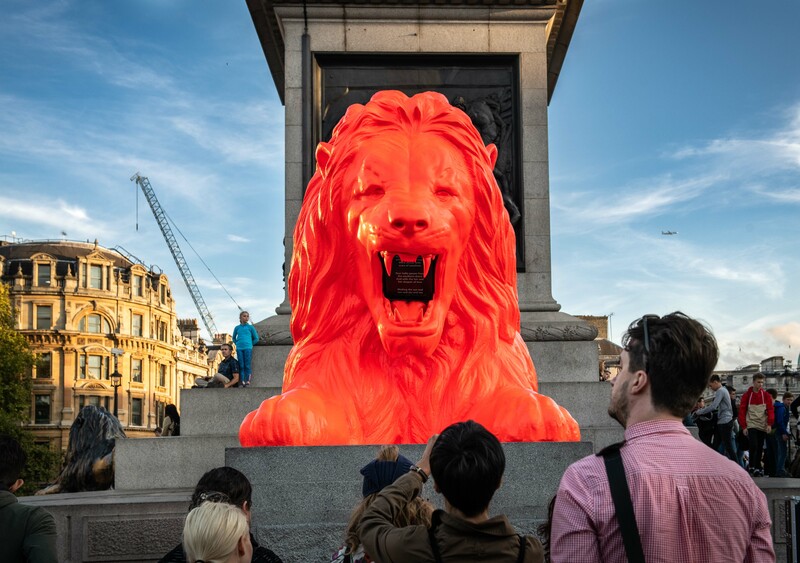 Located in Trafalgar Square, Please Feed The Lions is a new interactive sculpture by award-winning artist and designer Es Devlin. Devlin is known for her innovative projection-mapped sculptures that fuse light, music and technology. Taking the London square by storm, the project incorporates machine learning, explores the parameters of design and AI, and follows a year-long collaboration with Google Arts & Culture which will also create an online exhibition so people all over the world can view and experience this ground-breaking sculpture. The project is supported by digital commissioning body The Space as part of its work to ensure the broadest access to the arts through digital technologies. Cast in 1867, the four monumental lions in Trafalgar Square have been sitting as silent British icons at the base of Nelson’s Column for the past 150 years. Last night, a fifth fluorescent red lion joined the pride, facing northwards towards the National Gallery. The new lion is not silent: it ROARS. This lion roars poetry: and the words it roars will be up to the public to choose. Everyone is invited to ‘feed the lion’: and this lion only eats words. By daylight, the ever-evolving collective poem will be shown on LED embedded in the mouth of the new lion. By night, the poem will be projection-mapped over the lion and onto Nelson’s Column itself: a beacon of streaming text inviting others to join in and add their voice.